Elastohydrodynamic Lubrication for Line and Point Contacts: Asymptotic and Numerical Approaches describes a coherent asymptotic approach to the analysis of lubrication problems for heavily loaded line and point contacts. This approach leads to unified asymptotic equations for line and point contacts as well as stable numerical algorithms for the solution of these elastohydrodynamic lubrication (EHL) problems. 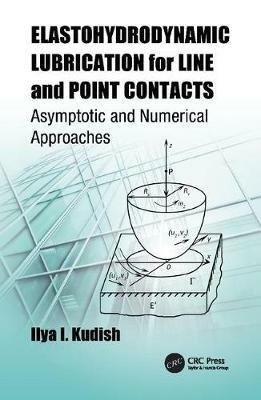 The book presents a robust combination of asymptotic and numerical techniques to solve EHL problems for lightly and heavily loaded line and point contacts. It also proposes a reasonably simple and naturally based regularization approach that produces stable solutions in heavily loaded EHL contacts. The book offers a clear understanding of the processes taking place in heavily loaded line and point EHL contacts as well as of the proper solution structure for EHL problems. It outlines concrete ways to determine important design parameters such as lubrication film thickness and frictional stresses and forces. The book establishes a close link between EHL problems for heavily loaded point and line contacts. In most cases, the equations in the book are derived from first principles. The author describes each of the asymptotic and numerical methods in detail, making it easier for readers to apply them to various problems. The problem solutions are presented in the form of simple analytical formulas, graphs, and tables. Almost all the chapters include exercises that highlight key points and skills. Suitable for engineering and applied mathematics students, this is also a unique resource for researchers and practitioners who want to fine tune their solution methods and design better numerical methods to tackle elastohydrodynamic lubrication problems. "Elastohydrodynamic lubrication (EHL) is a relatively new area in the development of lubrication theory and practice. This monograph is devoted to selected performances of liquid lubricants, particularly mineral oils and synthetic fluids. ... combines asymptotic and numerical techniques to solve EHL problems for line and point contacts. Most chapters include exercises with different levels of difficulty." "... the present work uses completely different mathematical tools represented by asymptotic methods. ... they enable to obtain very elegant and useful limiting solutions that accompany numerical methods or gave answers to stiff problems where these later techniques converge with difficulty or fail. The book is very well written, with an excellent mathematical background and bridges in a successful manner the gap between mathematics and technology. The reviewer strongly recommends the book to all lubrication scientists from academy or industry." "This book offers a comprehensive approach to the solution of the elastohydrodynamic lubrication (EHL) problem under a wide variety of operating conditions/regimes using a combination of asymptotic and numerical techniques. It also offers insight into physical aspects and phenomena governing the EHL problem such as lubricant rheology (Newtonian and non-Newtonian), solid properties, lubricant degradation, kinematic considerations, soft solids, grease lubrication, non-steady operation, starvation, [and] mixed friction ... In addition, a variety of problems are offered at the end of each chapter, helping readers reach a higher level of understanding of the complex nature of the EHL problem." "This book introduces to the tribology community the application of asymptotic methods to solve an important and difficult class of problems in lubrication. These analytical techniques overcome some limitations of traditional numerical schemes for determining EHL film thickness and, moreover, aid in the development of insight as to the physical mechanisms at play. ...like the comprehensive coverage of EHL regimes: line and point contacts, lightly and heavily loaded conditions, Newtonian and non-Newtonian rheology, isothermal and thermal behavior, steady-state and transient conditions. I also like that the author provides a detailed introduction to lubricant rheology. ...I am confident that the work is both technically sound and practically relevant. The author appears to take care in providing a systematic and rigorous treatment and conveys a good appreciation for the engineering implications of his work. ...This book provides a welcome contribution to the topic of elastohydrodynamic lubrication (EHL), which is critically relevant to the operation of gears, rolling element bearings and several other machine components. The author demonstrates pitfalls associated with traditional numerical approaches and effectively applies analytical asymptotic methods to develop solutions for various EHL regimes, including those with thermal, non-Newtonian and transient effects. ...This book introduces researchers in tribology to a powerful mathematical technique that promises to advance lubrication theory."